Sensitive information (such as credit card data), is collected only through PayPal, which provides a secure and encrypted transaction. Your credit card data does not leave the PayPal site during a transaction with ClassicsToday.com. We also protect your information offline. Only employees who need the information to perform a specific job (for example, renewal or customer service) are granted access to personally identifiable information, such as your email address. 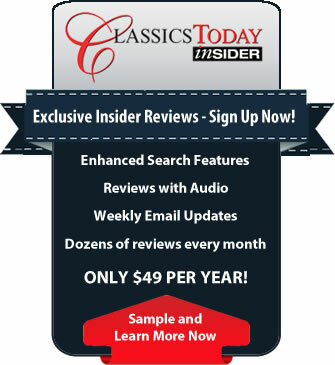 A subscription/membership in Classics Today Insider entitles the user to full access to all exclusive Insider reviews and editorial content, including a searchable archive of all past Insider reviews. Subscriptions are for one year (365 days), at a rate of $49.00 per year, and are non-refundable. In order to give users full control over their subscription renewal decisions, we do not offer automatically recurring billing; users must renew their subscriptions at the end of each 365-day period.